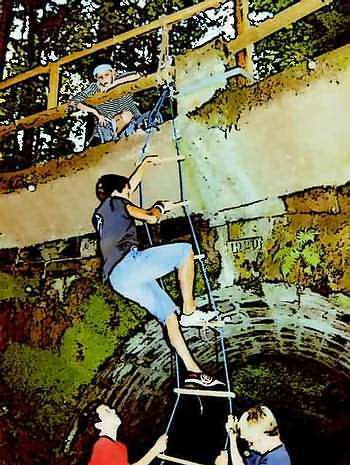 For our station games, we always set up, depending on the terrain, at least, one station where a rope ladder was used. The ladder can be free hanging or hang down along a cliff or steep slope; if possible at a slight angle (safest variant). The rope ladder was set up as part of an obstacle course. In other words, the participants were timed running the obstacle course and climbing the rope ladder was part of it. The most important thing when implementing a rope ladder is to pay close attention to safety procedures. Firstly, the ladder must never be an insurmountable obstacle and should never be longer than 5m. Second, it needs to be placed in a way, that if someone falls, the person does not hit rocks or other hard objects. Third, the ladder must be securely fastened. Fourth, all rungs are to be check in advance whether they are all are still connected properly. If you pay attention to all possible things that can go wrong and eliminate them beforehand, really, nothing can go wrong during the obstacle course anymore. Depending on the age of the participants, you might have 1-2 helpers stationed at the rope ladder. How to build a rope ladder? Material: 2 long polypropylene ropes (at least 10-12mm thick), battens (each about 40cm long), drill and drill bit (diameter of the rope). Build a rope ladder and use it for a game station. Cut each batten into an equal length of 40cm. On the left and right, each drill a hole about 3-4cm in from the edge. Now pull the rope through the first rung. Leave about 3-4m rope for the ladder suspension. Right underneath the first rung you make a knot preventing the rung from slipping down. Then pull the rope through the next rung and again make a knot right under it. The rungs should be 30-40m apart. Now continue with the remaining rungs until you have about 1m rope left, which you will need if you want to fasten the ladder at the bottom to prevent it from swinging. To make sure that the rungs are evenly fixed it is advisable that you always attach one rung at the time and fix it on both sides before you continue to the next rung. The rope ladder shown in the picture below is 30 years and was used countless times. 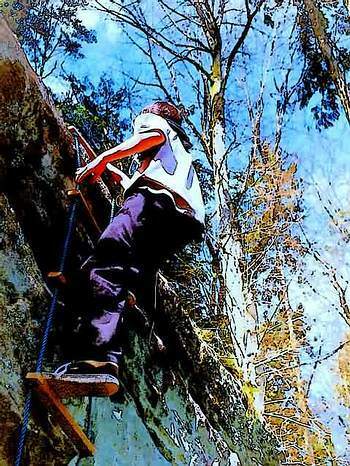 Of course, there are other techniques to build a rope ladder such as the use of small round logs with notches and a rope ladder knot to fasten it. Important in all cases: the rungs must sit securely, and the wood you use must be sturdy and unbreakable.